Round 2: Steve vs. Amy in "Ticket to Ride"
In Round 2 of our matchups, we tied in wins with 8 games each. You'll note that our more recent games have included the awesome new Alvin & Dexter Monster Expansion, which really adds so much more fun to any Ticket to Ride game. On the wall you'll also note our "W+D" references, which represent the "Warehouses and Depots" game elements that are part of the Europa 1912 Expansion (and like Alvin & Dexter, can be added to any version of Ticket to Ride). This expansion also includes new Destination Tickets much like the USA 1910 Expansion for the original game, except that Ticket to Ride Europe is now the benefactor, providing 3 different expansion games to play (Europe Expanded, Mega Europe, and Big Cities of Europe). Providing a fun break from regular TtR games, our friend Jason Steele gave us a fan-made map of the London Underground which really was quite different. We haven't released the monsters on this city yet, so apparently the folks on London are safe for a little while longer! I'd also like to point your attention to a fan-created set of rules called the Ghost Train, which actually did a very nice job of tightening up the USA map for a 2-player game. Such a simple concept, but it added a lot more cutthroat action in a recent game. Finally, I'm particularly proud of the Nordic game we played where I won with the really low score of 71-57. This game almost had me sleeping on the couch because I ended up defeating Amy in under 20 minutes using a strategy I read about online. She was NOT happy about that technique. Needless to say, I haven't used that strategy since then. Who's ready for Round 3? 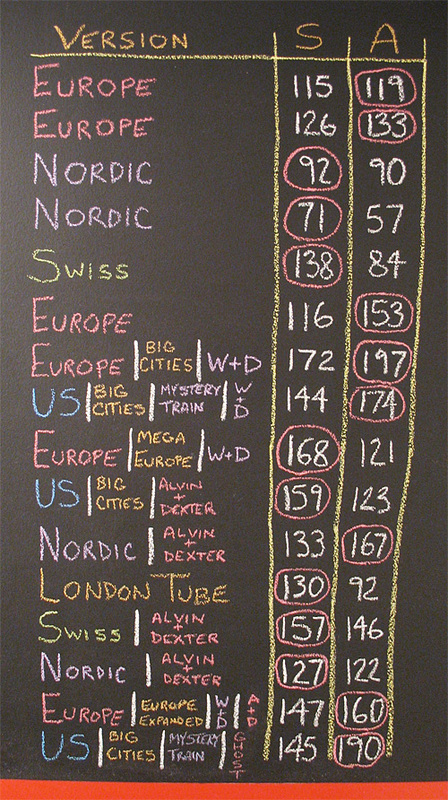 Were DOW to release another city/state/country board what would you like to see? Something contemporary like Australia, something oldey timey like Roman Chariot roads, or something crazy futuristic like space trains to Mars? I wouldn't mind if Days of Wonder came out with some crazier ideas. They have been really heavy on Europe-based releases (given that company is based in France and the style is German, I guess that's understandable). But would be nice to see other parts of the planet represented. Then again, I also wouldn't mind seeing stuff like space, or time travel, or even "railroads of history" represented. Let's get crazy… I mean, we have monsters now, so why not? We'll definitely see some new maps released in October as part of an announced "Ticket to Ride Map Collection." That is currently being built with contest entries and some maps from the game's original creator.